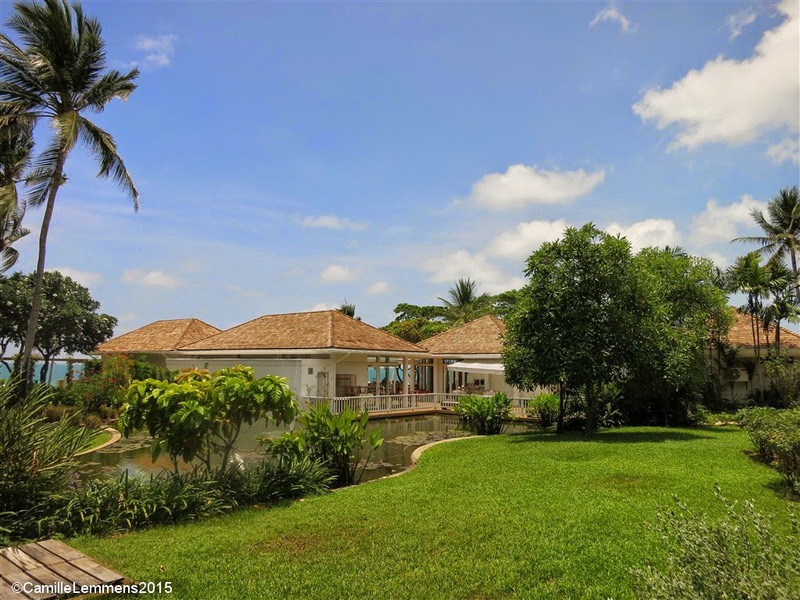 A small milestone on has been reached, the stunning amount of 4000 posts on the Samui info and weather blog has been reached with this blog. 16th February 2007 saw the first post on this blog and my dear, did I ever know where this would lead to! Little did I know indeed where this journey would lead to. Each day around 7am local Samui time, I get ready to write my daily weather update, an essential part of my life now, since 9 years! All the locations I have been to since I started this blog, in and outside of Thailand and how it progressed in design. I'm looking forward to at least another 4000 posts and ideally more, feel free to join me in my journey! Thanks for checking in, dropping by, reading my posts and leaving comments! Don't stop supporting the blog, donate or use my Agoda and Hotels Combined booking adverts, it allows me to keep this blog going, besides my own enthusiasm. 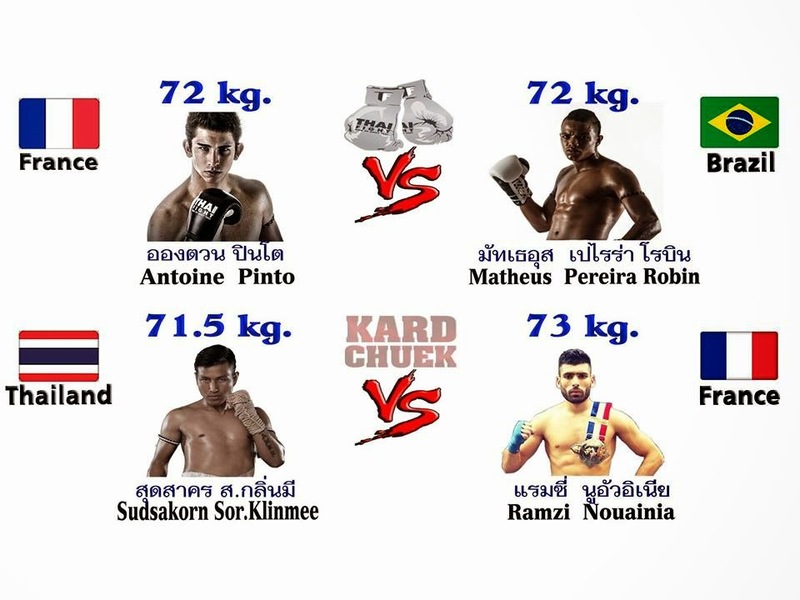 It's on this weekend; Thai Fight Samui, 2nd May 2015. 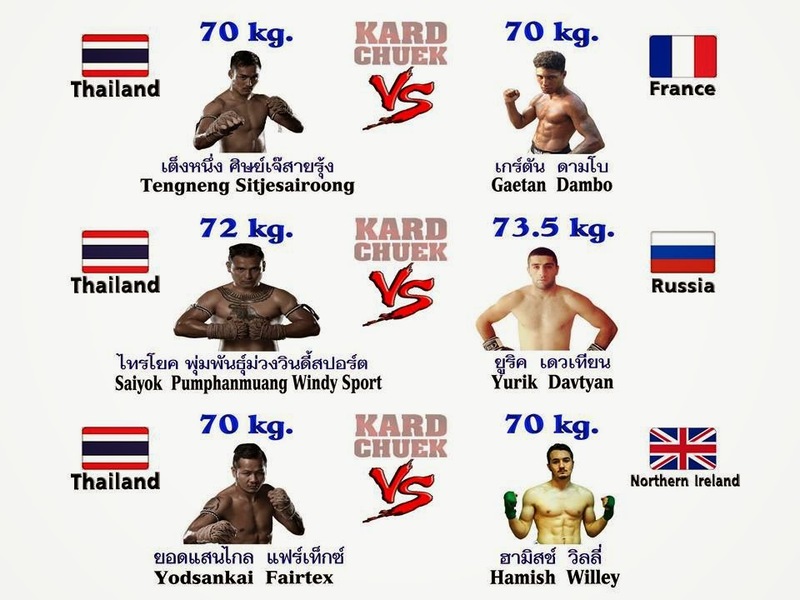 This as big as Muay Thai will get on Koh Samui. It's our own Tourism Association of Koh Samui who are bringing the biggest Muay Thai organization onto the island. 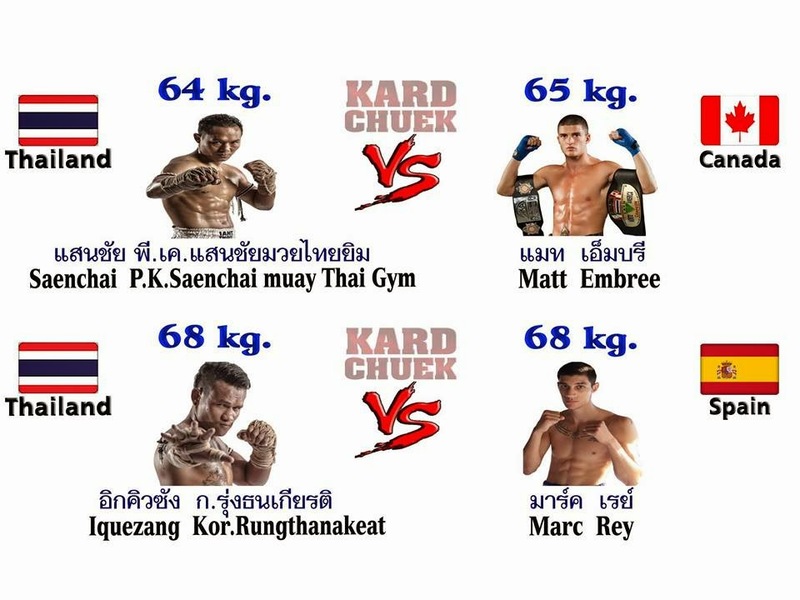 Thai Fight is known for it's great fights, Muay Thai superstars and amazing show. Muay Thai is the number one sport in Thailand. Thai Fight will give you the chance to witness live why this martial art sports is so popular among the Thais and enthusiasts from around the world. Fight sports are not my personal favorite and although I could have the tickets of my sister in law, I was not going to attend. However, over the weekend we will be in Thung Song, where I will run a 10km race, the second race for me this year. Having said that, this is a big event and Thai TV Channel 3 will be broadcasting this live. 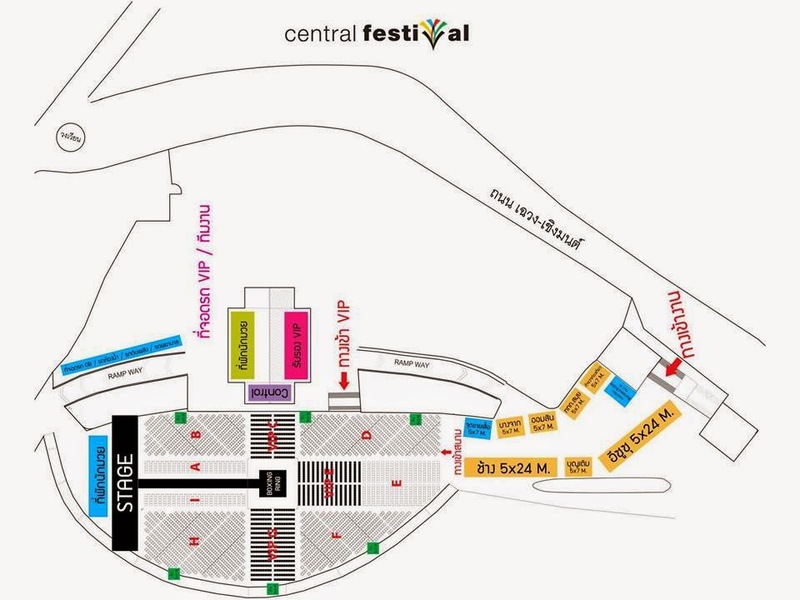 Doors open at the Chaweng Lake or Phru Chaweng at 3pm and the live broadcast is between 5.30pm and 8pm this Saturday. Thai Fight is also known for it's Muay Thai 'superstar' fighters and some of the best will come to fight on Koh Samui, like Sayoknoi, Saenchai, Yodsanklai, Sudsakorn, Antione and Leo Pinto and many more. There are limited seats so get your seats early, or did I mention that already? Hope you will enjoy this unique event on Koh Samui and if you can't get tickets, you can watch it live on Channel 3! The date has been set for the 8th Four Seasons Cancer Care charity fun run, 22nd August 2015. This is usually held at Nathon in a nice race track with a 5km and 10km race to choose from. 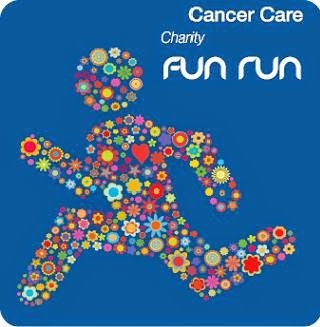 As far as things look like right now, I may be actually on the island and be able to participate for a 5th consecutive time in this 8th Four Seasons Cancer Care charity fun run, 22nd August 2015. The 10km race will typically start near the Seatran pier and go out up the hill towards Maenam, backtrack a little bit and go off into the backstreet , slightly hilly alleys (or soi's as they are called in Thai) to end up at the Seatran pier again. A nice race track with some nice green views. There will be two more races coming up on the island, that I know of right now, 13th September will see a 10km race organized by Kamalaya and 11th October will see a follow up 10km race organized by the Starwood hotels, which last year was held as the 'Mad Hatter' race. For these two races I may not be on the island. As of now, I don't have any knowledge about a repeat Koh Samui marathon which was held last year in December. It's the last day of the month and time to say Goodbye to April 2015. It's been an interesting month for the weather. After about at least 10 weeks of drought, Songkran day or Thai New Years day saw the first rain in almost three months time! It rained hard that day and the next two days before it turned warm and sunny again. There were a few other days with rain around the island however and it made for interesting days with cool and on the other hand hand very hot temperatures. Other big news this months was without a doubt the bombing at Central Festival, which came as a shock to many or almost all people living on the island. Work wise it was nice to be able to spend a lot of time at home for a change, after having completed the Khao Lak PADI IDC earlier this month. It's good to be able to spend time with the family. On the food front, we visited Kobori for a nice Japanese lunch and write up about the Coast Beach Bar & Grill is about to follow soon. Thanks for dropping by and checking into this blog, please let me know if you have any remarks and other than that, I'm already looking forward to next month, May 2015! The forecast predicts sunny skies for the next ten days, enjoy but don't forget the sun lotion! 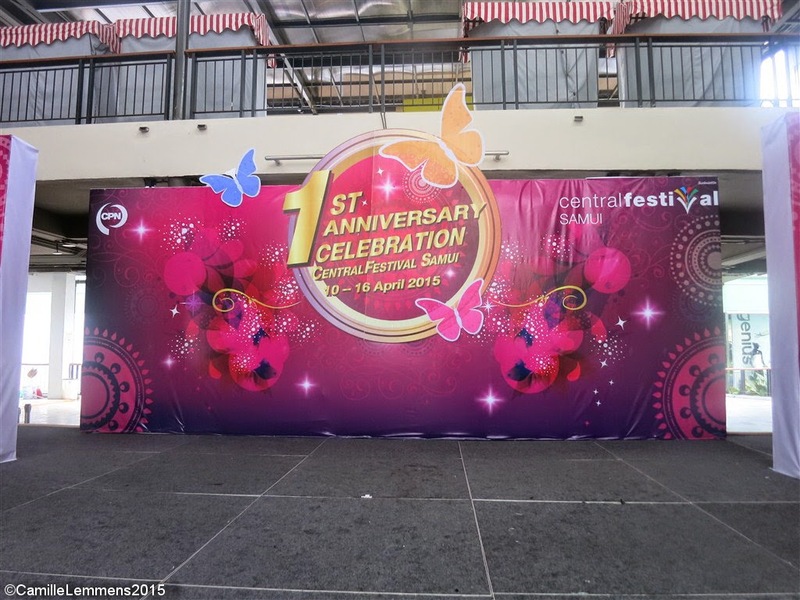 On the occasion of the 19th Anniversary celebration of Centara Grand Beach Resort Samui in Chaweng, they will have for the second consecutive year running a 'Charity Cake Sales at Central Festival Chaweng 8th May 2015'. 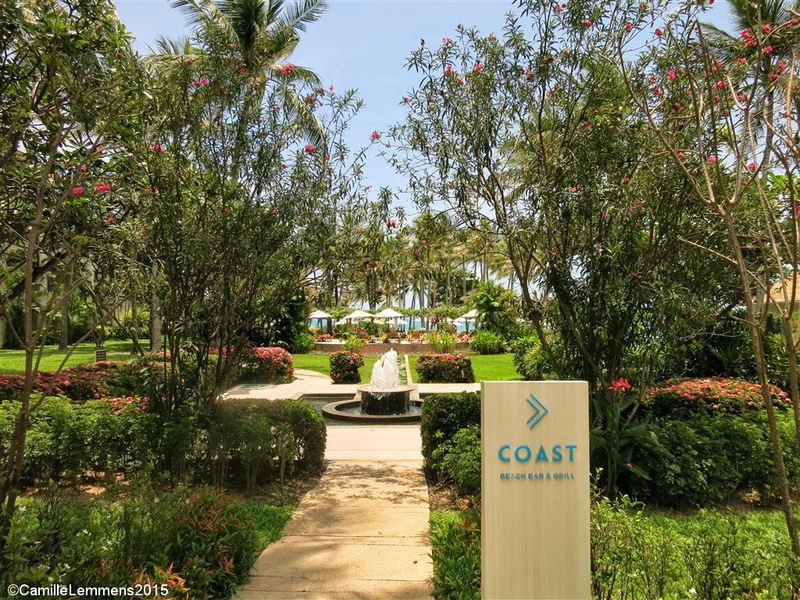 Have a look at my recent post about our families visit to 'Coast Beach Bar & Grill', located at the Centara Grand Beach Resort. 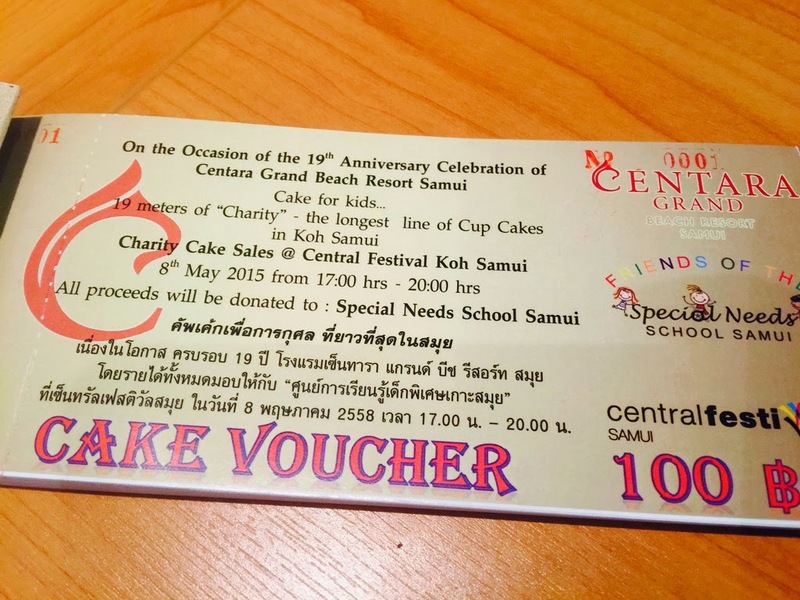 You can buy tickets at 100.-THB a ticket at Centara Grand Beach in Chaweng or on the day at Central Festival and get one of the 19 meter long cup cake line, the longest line of cup cakes on Koh Samui! The event will take place on Friday May 8th from 5pm to 8pm and all proceeds will be donated to the Special Needs School Samui, a very worthy case! The forecast predicts a few cloud and actually quite a bit of rain for today, we'll see how that develops! As of tomorrow it should be just plain sunny and nice for the next ten days! 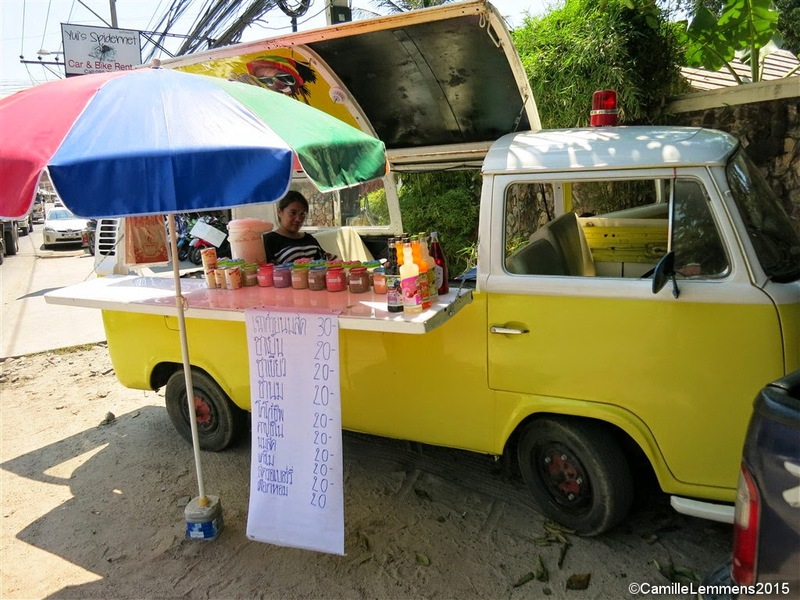 We're back with another post of Food on Wheels; Coffee and tea in a VW this time around! 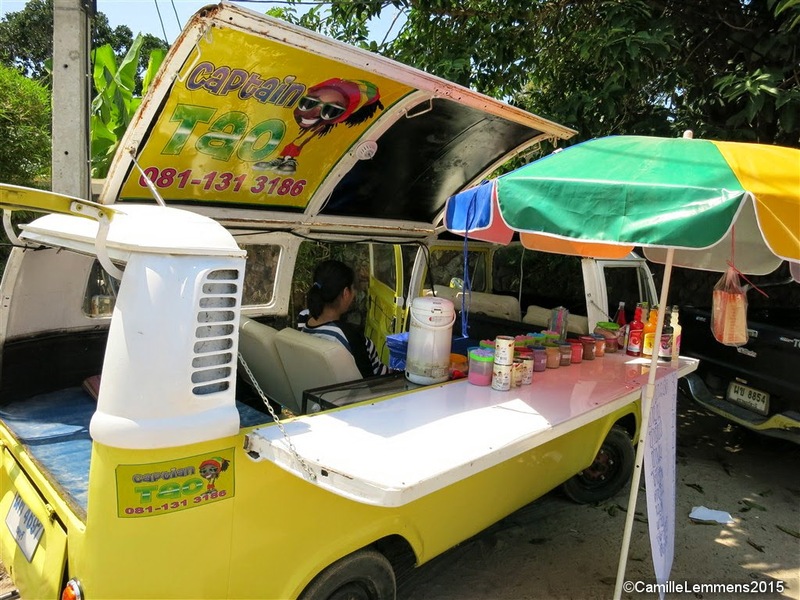 Last month I didn't have a Food on Wheels contribution, after 68 posts about this topic, spreading my food wings over various countries, it becomes harder and harder to find some new and, at least for me, exciting options. 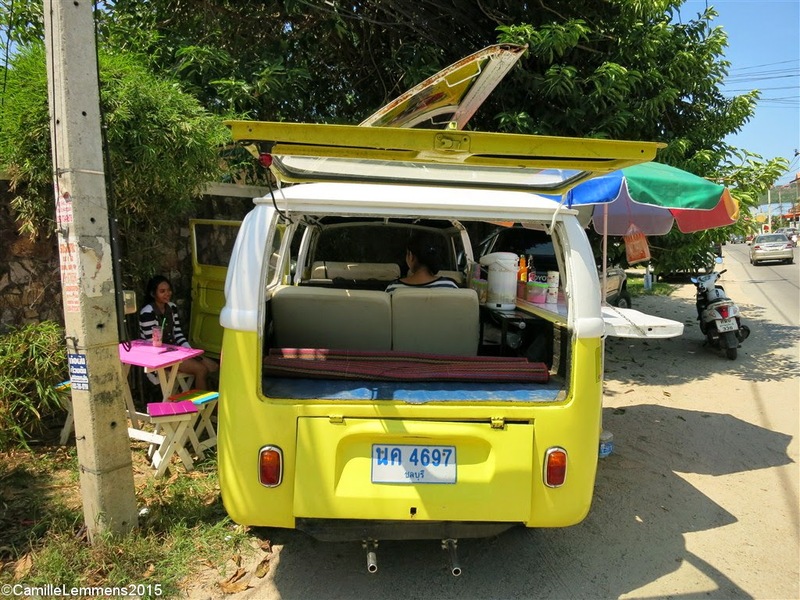 About a week ago I was cruising down Bang Rak beach road when I saw this old Volkswagen van and it wasn't selling alcohol! This was in broad daylight, so it peaked my attention and I swiftly turned around to check this out. Oh my dear Buddha, it was a Mum and daughter selling hot coffee and a wide variety of hot or iced teas on this hot day! Nowadays you can spot a lot of these old Volkswagen Type 2 camper vans being rebuild, with a roof that can be extended or opened and most of the times you can find them in busy, touristy areas at night, selling cocktails in downtown Chaweng on Koh Samui, Bangkok's Sukhumvit smaller side sois or in Pattaya. 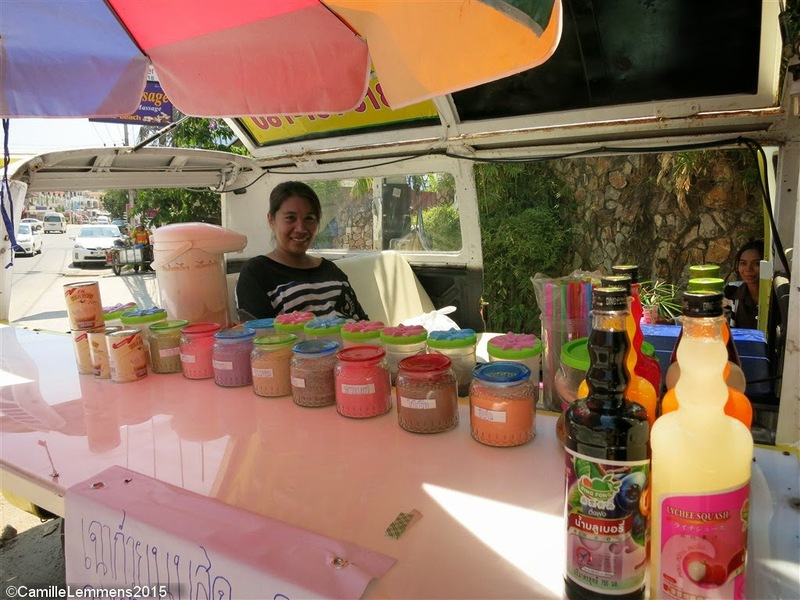 This mother / daughter combination was selling hot drinks on a hot day and not too surprisingly, they weren't doing a lot of business, almost exclusively catering to Thai customers. The variations in tea are interesting though, you could even have a coconut flavored tea. I can only wish the ladies good luck and God speed with their business plans, it may have just been a slow at the office last week, but I doubt it somehow. 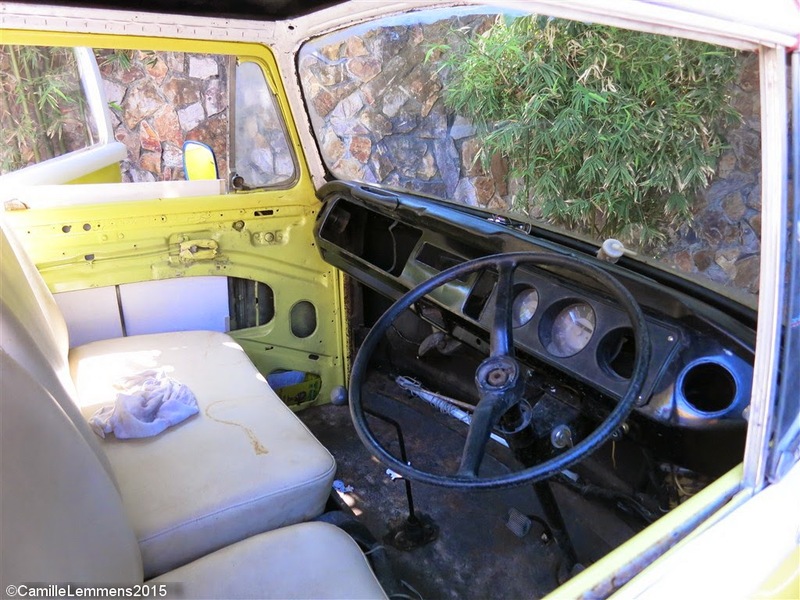 It's good though to see another VW camper van being made to good use and I sincerely hope this sample will survive a lot longer than it already has. Couldn't let it go without taking a picture of the drivers seat! Hope you enjoyed this little contribution to my Food on Wheels series and good news for next month, I may have sighted another suitable photo opportunity for next month already. Thanks for dropping by and see you next month. The forecast predicts some heavy cloud formations tomorrow morning but after that it should be sunny and nice for the next 10 days. The forecast tells us that after today it should clear up and we get mostly sunny days back again possibly with partial cloud cover and a very occasional tropical shower. 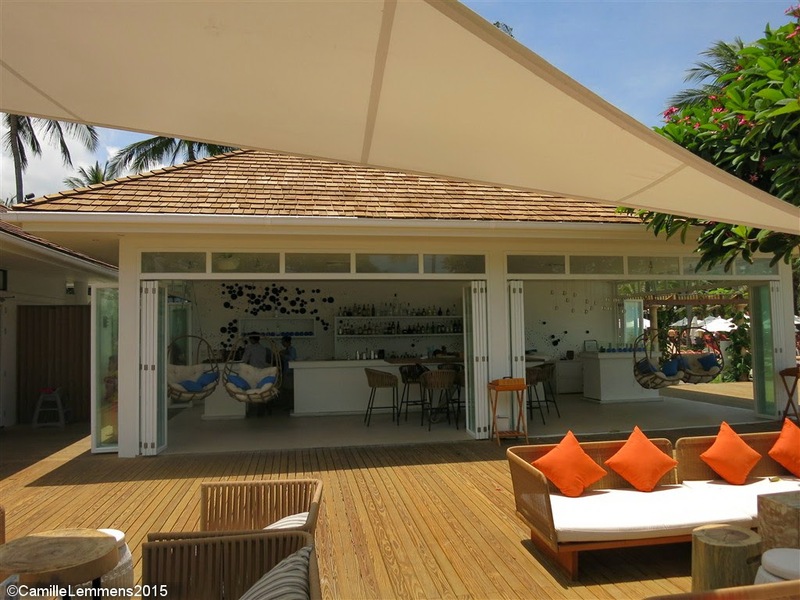 Around Koh Samui we have a partially clouded sky with almost no breeze at all. The forecast is looking good, a slight change for the better is coming up, by Tuesday the clouds should have mostly gone and partially clouded skies with a very occasional tropical shower may cross your path. The forecast shows mostly cloud cover and isolated showers for the next 7 days with occasionally some sunny breaks. The forecast predicts mostly cloudy skies until mid next week with possibly rain on Sunday and Monday. The forecast predicts heavy cloud cover, almost 100%, until Monday but hardly any rain. After that it will ease up and sunnier days may emerge again. 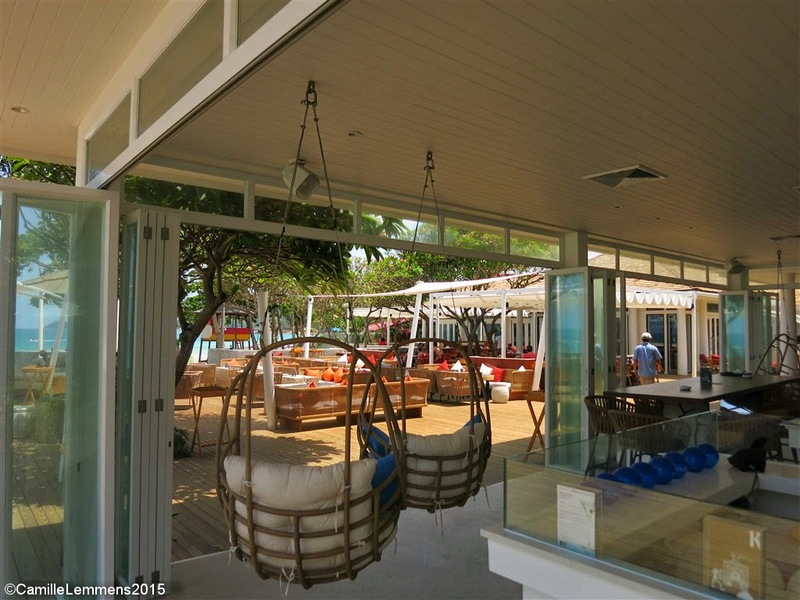 This recent Sunday we visited the Coast Beach Bar & Grill, which is located at the premises of the Centara Grand Beach Resort in Chaweng. 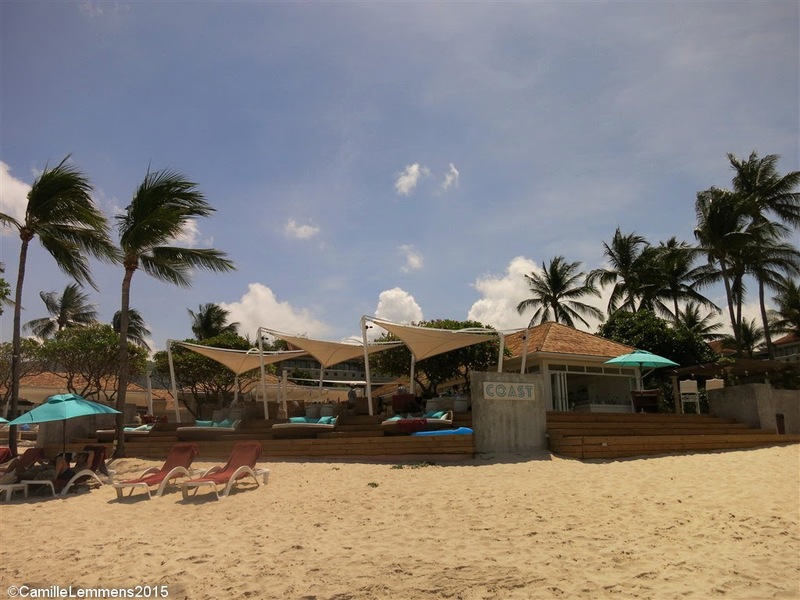 The Coast Beach Bar & Grill caters to a wide range of beach aficionados and offers some great beach and ocean views with a great menu and food options to boast. 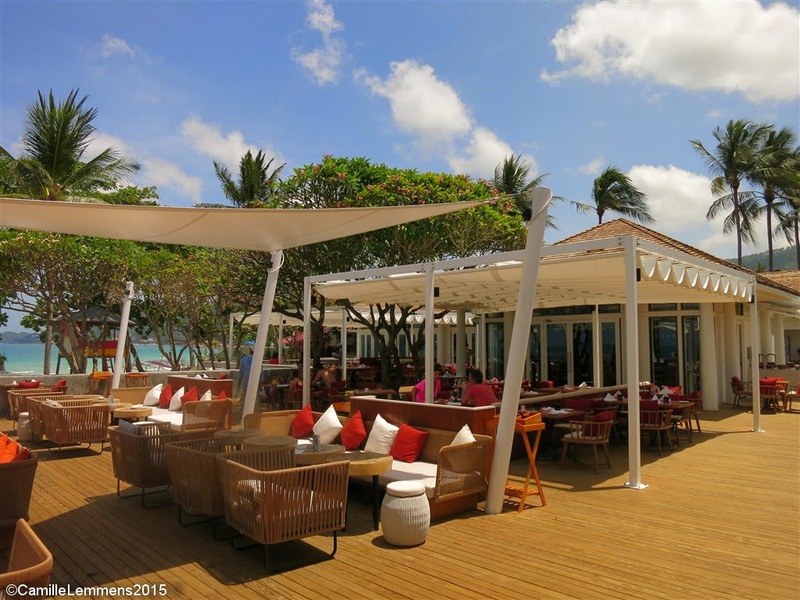 This is the perfect location of spending a day on the beach, whilst having great lunch and dinner options available, without being surrounded by a party crowd but rather a more jazzy feel to it with a relaxed atmosphere. We joined the Sunday brunch, which up till the end of this month will be held each Sunday but as of May will be offer on the first Sunday of the month. There are three different brunch options. The brunch includes Tasmanian Salmon, Alaskan King Crab, Imported Cheese & Cold cuts (my favorite), an oyster bar and a grill station with among others lamb cutlets. We went with the whole family and weren't the only ones with the same idea this weekend, couples and families alike were enjoying the sunny day and the food and drink options. We stayed all afternoon. from noon to around 5pm but you can stay on for dinner as well and enjoy the candlelit environment. Each day of the week has a different evening arrangement as well, like a jazz evening, a wine and cheese buffet evening and a Saturday Beach BBQ. The staff is very friendly and always there when you need them without being in your face, which is very pleasant and helpful. 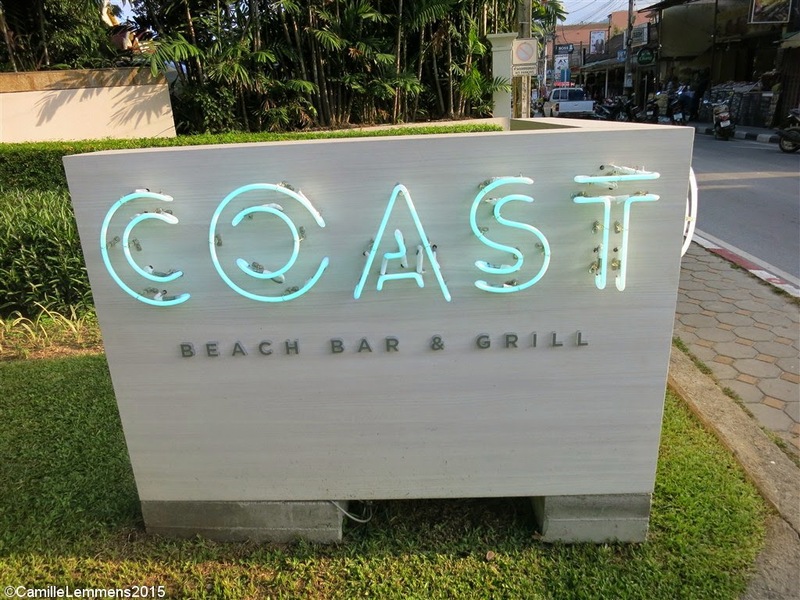 The bar at Coast carries some special drinks on offer that are exclusive of Coast Beach Bar & Grill and are only available here, including some whiskeys and Bourbons. During the daytime various tapas are being served at your table and they were included in our brunch. It didn't require hard work to enjoy the afternoon, eating, drinking and chatting away and before you know i, you realize that time flies when you're having fun. The children swam in the ocean and we received complimentary towels and the brunch includes also the use of other facilities of the resort, like the pool. For more information, please visit their website or Facebook page and enjoy the perfect mix of urbane flair and relaxed beach vibe! Yesterday must have by far the hottest day we had so far this year. A stunning 36.6C was the max temp. The forecast shows clouds and possibly some rain for tomorrow, followed by a few days of cloudy skies, except Sunday, Tuesday and Wednesday. Yesterday saw a very hot day with a max temp of 34.7C It was steaming! The forecast predicts some clouds on and off during the next couple of days with possibly some minor rain showers. 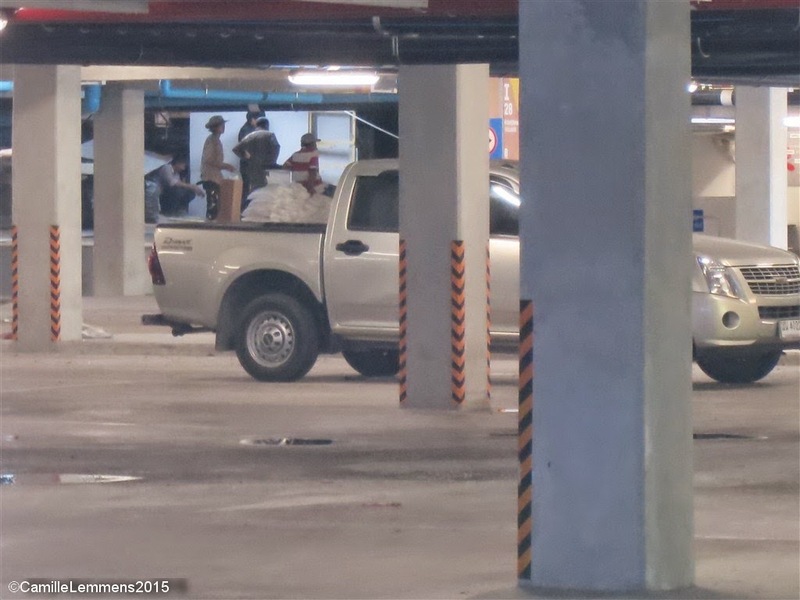 The Samui car bombing investigation seems to come up each with little tidbits of information. The forecast predicts two more days of sunny skies and come Thursday some more clouds may move in, possibly bringing in small and short showers. I just ran a half marathon distance, starting at 5am and it was very humid. No real news on the Samui bombing, except more articles claiming it to be politically motivated with excluding the Southern unrest. The forecast shows a cloudy Thursday but otherwise nice blue skies and sunny days. All rain seems to have disappeared for the next seven days. 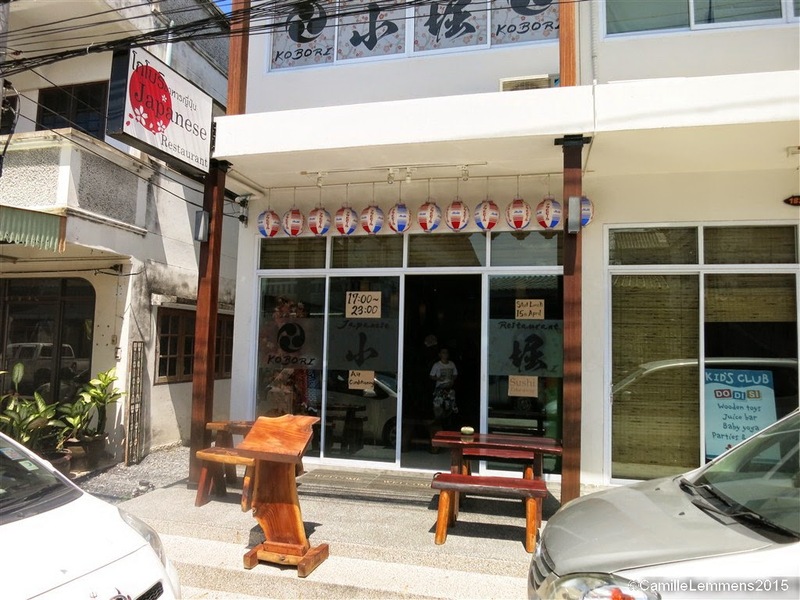 My fave; Kobori, Japanese restaurant in Maenam is now open for lunch. Since the 15th April Kobori offers exclusive lunch opening hours between 13.00 and 15.00 hours or between 1pm and 3pm. 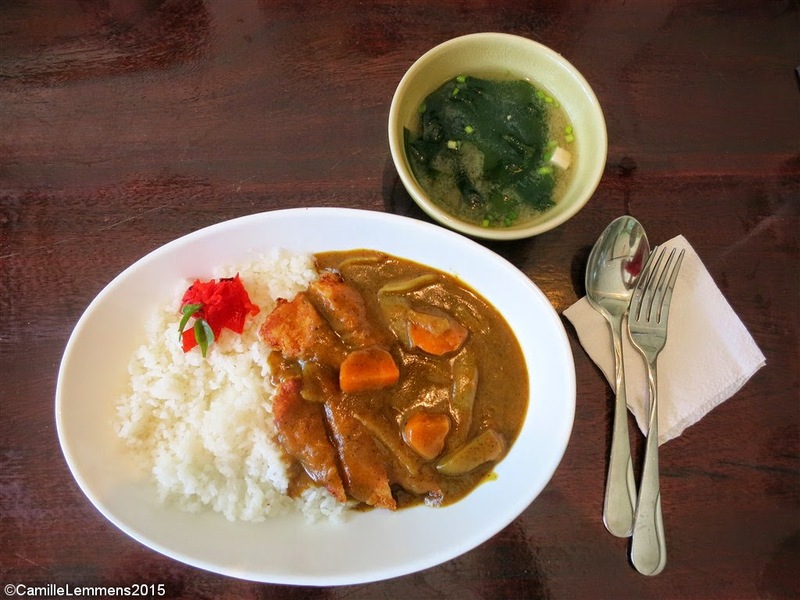 The focus is on the traditional japanese curry with rice and various options are on offer, Pork, chicken, beef, pork cutlet, pork Hamburg, pork beef Hamburg, chicken fry, prawn fry and fish fry. These options also come in 6 different shades of spiciness. It's been a long while ago since I had my first Japanese curry with rice and I was stunned back in those days that it actually has an Indian taste to it. Nowadays I really enjoy the japanese rice curries. We went for lunch with my whole family and I wasn't sure if they would actually like the Japanese variation of a curry. To my enjoyment, they all loved it and thought it to be 'aroy maak'. 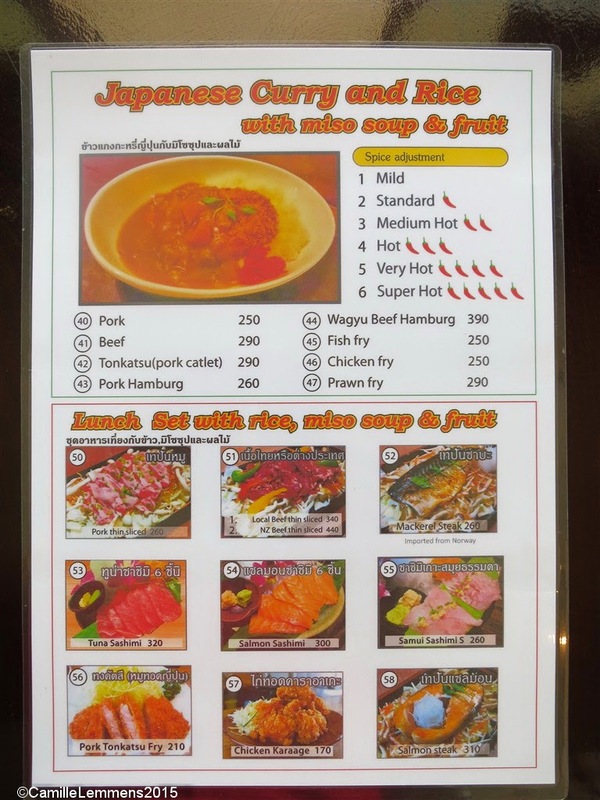 Besides the Japanese curries, there are also plenty of other a la carte lunch options available to you. 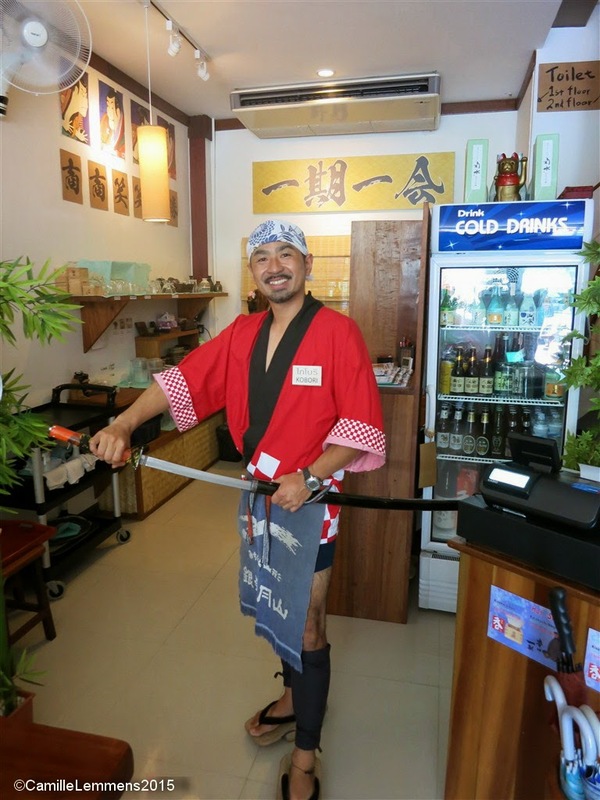 It's well worth going either out of your way or hop in when you're in the hood, for an authentic Japanese lunch in still my absolute favorite Japanese restaurant on the island. 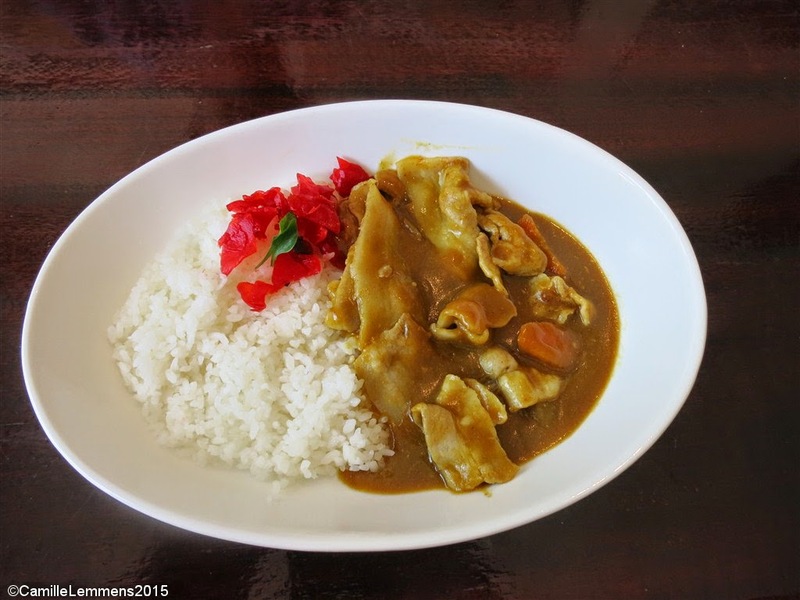 Prices on the lunch menu are decent and the curry portion fills you nicely and comes with a small bowl of miso soup. Hearty and enjoyable. As always, we had a very good and enjoyable experience and meal and I can highly recommend Kobori restaurant in Maenam for their newly opened lunch service and as before for their dinner options. 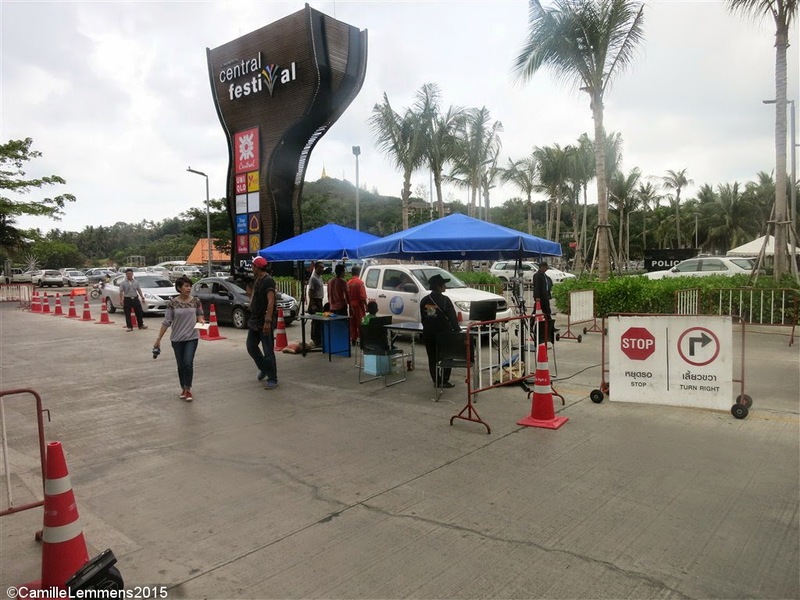 The Royal Thai Police claims that they have enough evidence to proof a political motivation for the Koh Samui bombing and have identified the people behind the bombing. The forecast predicts nice and sunny weather until mid next week when more clouds and possibly an occasional shower may occur. 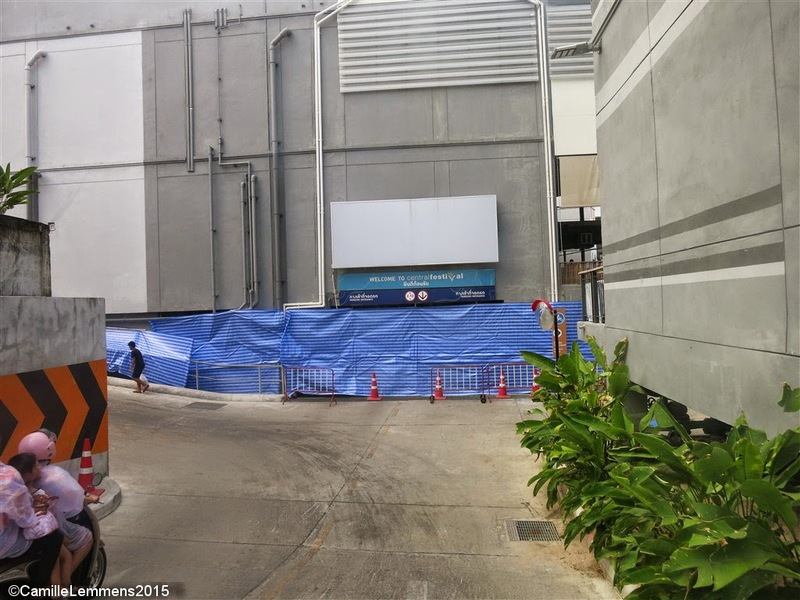 It seems the culprit for the Koh Samui bomb attack might have been found as one of the suspected security guards. 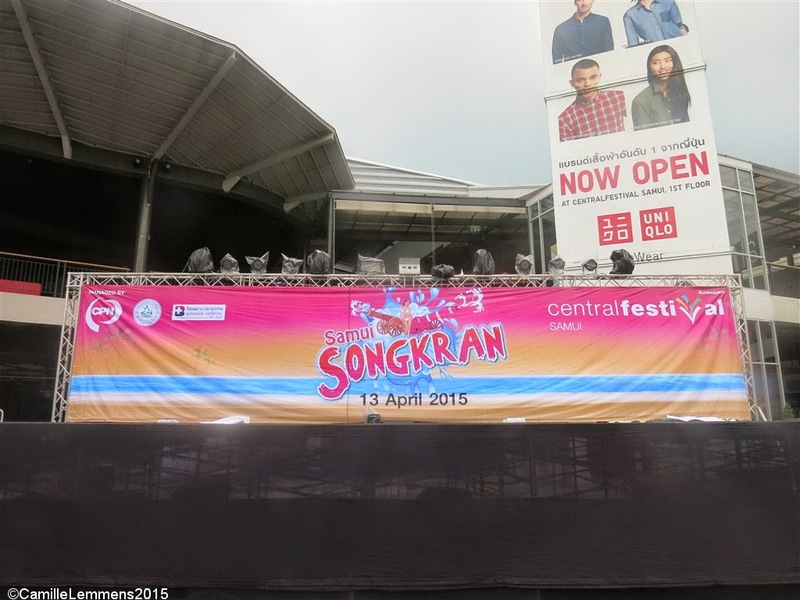 The last day of the 'deadly seven Songkran days' saw 58 killed on the last day and 306 over seven days. Now it's back to normal, which apparently is even worse with some 500 and a few more deaths per week in average. 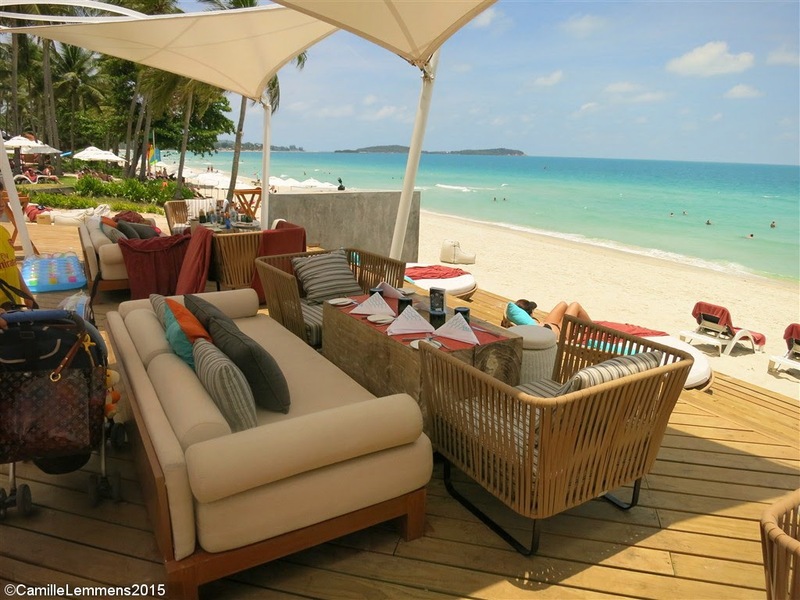 Yesterday saw a sunny day around Koh Samui with a max temp of 32.7C No rain in sight! The forecast predicts sunny weather for the next couple of days with more clouds and possibly a few scattered showers before next weekend. No real update or news on the Samui bombing but general concern about the long term fall out is on everybody's mind. The sixth day of the 'deadly seven days' of Songkran claims 306 deaths so far, with one more day to go. The forecast is looking good, the sun ss back and here to stay until late next week, when clouds and rain may move in again. Latest news on the Koh Samui bombing is to blame it on a political motivated act of terrorism according to military sources although the police seem to have a different opinion. Yesterdays death toll count of the seven mad days of Songkran reached 251 deaths after day five. The forecast less and less clouds over the next days without any rain, now let's see if the actual weather plays along! Central Festival Koh Samui after the bombing, just a few days ago. The shopping mall closed down for one day but after that it was business as usual. Well, almost. 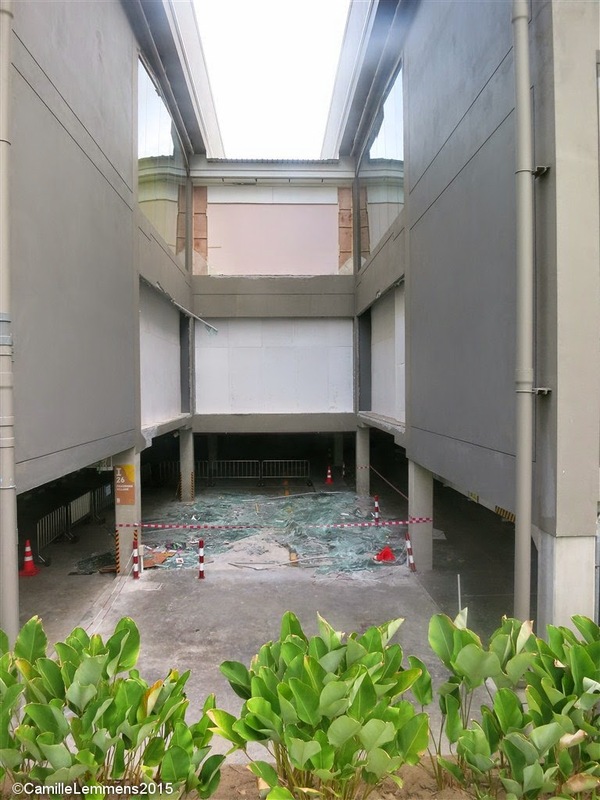 The bomb went off near the Phru or lake Chaweng side, possibly in an attempt to do as much structural damage as possible. Above is our 'favorite' car park entry pictured. We park our car most of the time pretty much where the bomb went off, although we never have been that late at the mall. The time the bomb went off raises several questions, why at that time? It almost looks like the bomb went off with trying to minimize human injuries or let alone fatalities. 'Only' seven people git lightly injured and could be released from hospitals shortly after being admitted. 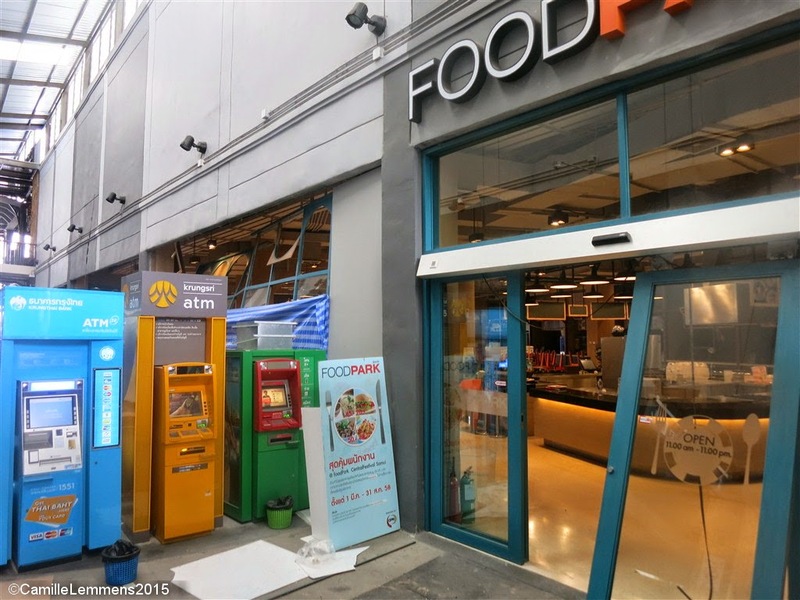 Damage to the food court, the door is out of order and glass structures are bent out of shape. Much more speculation is rife about the motives and at the moment two theories prevail, one as being a local affair and one of being it a political motivated attempt. Koh Samui has been in the news recently with lot of TV shows on the island, checking for stories. When I took this picture, a TV crew is just about to leave the security checkpoint after having filmed and interviewed various people.